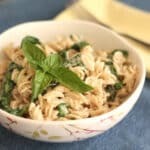 Warm pasta tossed with fresh basil and spinach in a very light cream sauce is an example of seasonal eating at it’s best. 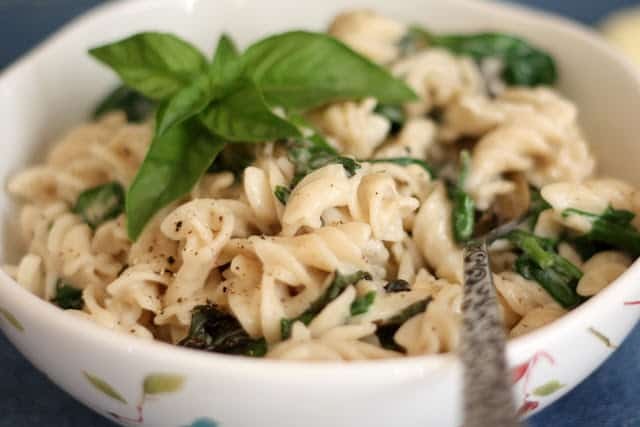 Inspired by the basil that is flourishing in our garden, this was a fun twist on pesto pasta and it still contained a fabulous load of flavor from the fresh basil. While I absolutely loved this pasta, my kids were less than impressed. Both of my older boys would have been happier without the greens and my youngest happily removed all green items from his plate before he ate the rest of his pasta. I’m calling this recipe a keeper though, because I have every intention of making this again, just for myself! Catching Fireflies is giving away a $43 gift card to one of my readers! I had a great time browsing through all the categories in their store. There are so many fun and unique items that I have already put on my own wish list. Earth Friendly Gifts, Summer Fun, Office Fun, Weddings, Babies, Kids, and a whole section devoted to Great Gift Ideas and so much more. Naturally, the Kitchen items caught my eye and I am now dreaming of the Food Face Plates for my own kids. I love them! All you have to do to enter the giveaway is comment on this post. The giveaway ends on Sunday, July 1st at 9:00 pm Pacific Time. Winner will be announced on Monday morning, July 2nd! GIVEAWAY CLOSED. Winner announcement here! Bring a large pot of water to a boil. Add the pasta, the minced garlic and a generous pinch of salt. Cook the pasta just until tender and then scoop out 1/2 a cup of the pasta water. Set the water aside and then drain the pasta. Pour the cream into the bottom of the same pot and warm it over medium heat. Once it is warm, add the pasta and about 1/4 cup of the reserved water back into the pot and toss gently to coat the pasta well. Add the basil and spinach leaves and toss to wilt. Season generously with salt and pepper and cook over medium low heat for a couple minutes, tossing constantly. Stir in Parmesan and remaining water as needed in order to achieve a creamy sauce that coats the pasta. Taste and adjust seasonings as desired. Enjoy! Great idea, my basil is just growing so fast in my garden and I've ran out of recipes --- but now I have another recipe for basil --yey! 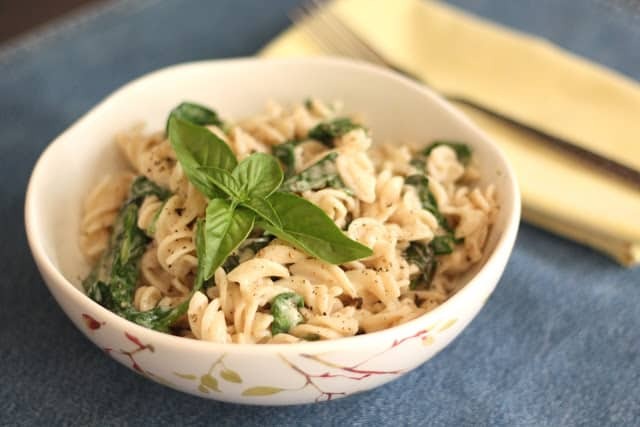 this pasta looks fantastic, i love fresh basil! Commenting, 'cuz I like to win stuff. Also, I am starving. I need to move in so that I can eat all this deliciousness. This looks great! I made something similar recently. What is it about basil and Parmesan? Yum! Maybe if you pureed the spinach into the sauce they would be more inclined to eat it? Just an idea. I love my greens though, I bet it would be great with swiss chard or even some kale in there! Yummy going to make for dinner tonight!! This recipe looks so good! I can't wait to go pluck some basil and whip this up! looks so tasty. sounds like a great company - thanks for the introduction to them. Looks absolutely delicious! You make me want to get up and go cook right now, hehe. Yum for the salad! I like your recipes! Made this for 12 people on Tuesday and served it with a big salad, breadsticks, and fresh fruit and sorbet for dessert. It was a huge hit and SO quick and easy to make, I didn't waste a lot of time in the kitchen instead of spending it with my guests, which is what happens every time I host a dinner. YUM!! I can't wait to try this dish. 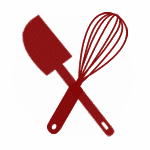 Love love love your ideas and recipes!